What is the FFA Alumni & Supporters? FFA Alumni is designed to formally utilize the cooperation of the community to support agricultural education and the FFA. An FFA Alumni affiliate or group is a tool for the location FFA chapter providing resources, whether that is monetary, human, or other resources, as needed. 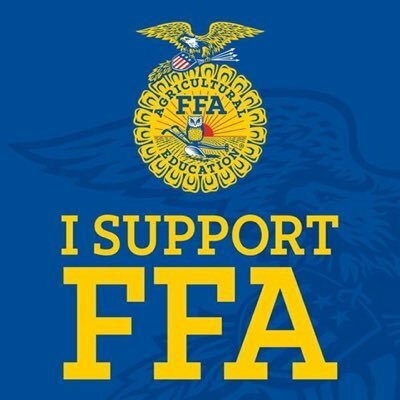 As volunteers and supporters of Agricultural Education and the FFA Organization, you do not have to be a former FFA member or wear the blue corduroy jacket. FFA Alumni is open to anyone who desires to support agriculture and the FFA. Please mark your calendar for the 2019 Toy Show! It will be held on Sunday, February 17 at Arlington School. Toy vendors will be onsite as well as craft vendors in the marketplace. Kids will enjoy the pedal pull. FFA Alumni members would like to recognize Brad Beach for his time and dedication to the organization throughout the years. He will be greatly missed! For further information or to join, please contact Jeremy Deter, Colton Kidd or any current alumni member. Your support is greatly appreciated!